After the initial dismay, disgust, and displeasure in the barrack housing, lack of privacy in communal latrines and showers, and communal mess hall food distribution, disgruntled inmates set about trying to improve their living conditions and developing a daily routine of coping with life in an abnormal setting. The women tried to beautify the interior of the barracks. The men tried to find some form of employment. The children tried to find and develop new friendships. Some of the men left Amache on temporary leave to assist sugar beet farmers harvest their crops. A few went to help farmers in the Grand Junction area harvest peaches. The inmates tried to help attain those goals and objectives as well as they could with minimal disruption. They developed a well organized and active recreation program with sports leagues in baseball and basketball for both men and women. An extensive adult education program was developed for the older men and women with classes in sewing, crocheting, weaving, knitting, dressmaking, paper flower arranging, art, woodcarving, painting and poetry. Special morale building events were organized to cope with the daily boredom of confined living. Such events included arts and craft festivals, agricultural fairs, 4th of July parades, carnivals, movies, talent shows, musical concerts, sports contests, dances for the young people and an annual Obon festival. In 1944 and 1945 there were funeral services for the Amache men who were killed in action fighting the Nazi forces in Italy and France. During the incarceration period there was a steady stream of inmates who left Amache. Some left for colleges and universities in the East and Midwest to complete their studies interrupted by the evacuation. Some left to obtain advertised employment. Some left to serve in the military. 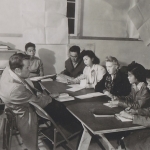 Some left to serve the war effort as instructors for the U.S. Navy Language program at the University of Colorado. Others left Amache to try to begin life anew in communities outside the exclusion zone of California, Oregon and Washington.